Hoping to find a better job to support herself, her fiancé and her 9-year-old stepson, Emily visited the Genesee/Shiawassee/Thumb MichiganWorks!. There she learned about an eight-week Center for Construction Research and Training Environmental Career Worker Training Program, an introduction to the skilled trades that seemed like a good fit with her previous experience as a laborer. She applied and completed that program with flying colors. Next she began the Michigan Bricklayers and Allied Craftworkers Union Local 2 Bricklaying Apprenticeship Program in September 2016. 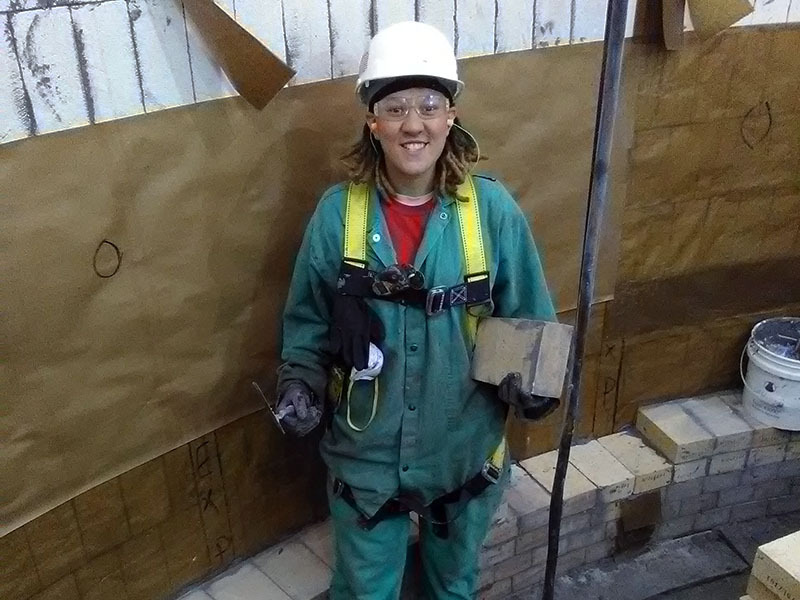 Now, one year into the three-year bricklaying apprenticeship, she is building a solid future, making a minimum of $20 per hour plus health care and pension benefits, and earning accolades from her supervisors, leading to her being featured in the Lansing Chapter of the National Women in Construction newsletter. Since beginning her apprenticeship, Emily has worked on projects in multiple environments, including on Detroit’s Zug Island, in a steel plant, and at a child development center. Her long-term goals include completing a bachelor’s degree in construction project management, working as a foreman, mentoring other women in the trades, and perhaps starting her own company one day. Upon completing her apprenticeship, Emily will receive an industry-issued, nationally recognized journeyman certificate. Nationwide, bricklayers earn an average salary of more than $50,000 per year according to the Bureau of Labor Statistics. Editor’s note: Emily’s story is one example of an effective workforce program in action. View more success stories here. Post provided by the Departmnet of Labor and written by Rhonda Burke, public affairs specialist for the Department in Chicago, Illinois.